Bonnie Louise Gunther, age 75, of Saginaw, passed away peacefully, surrounded by her family on Saturday, March 24, 2018. The daughter of Wilbur and Frances Geese, Bonnie was born on August 23, 1942, in Saginaw. e, and being with family. Bonnie is survived by her loving children, Jeff (Carol) Gunther, Steven (Kay Marie) Gunther, and Lori Milks (Kevin Szafirowski); dear grandchildren, Amber (Glenn) Taylor, Jeffrey (Nicole) Gunther, Joshua Kretz, Kaitlin Szafirowski, and Kayla Szafirowski; great grandchildren, Dylan Taylor and Harper Gunther; siblings, Wilbur “Bill” Geese, Joseph (Sherri) Geese, and Judy (Rick Knecht) Gunther; many nieces, nephews, and cousins. 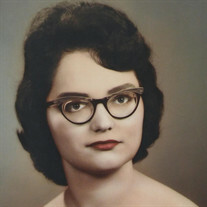 Bonnie was preceded in death by her parents, son in law, Jim Milks, former husband, Gary Gunther, and many aunts and uncles. According to Bonnie's wishes, cremation has taken place. A Memorial Visitation will be held on Wednesday, April 4, 2018, from 10:00 a.m. until time of Memorial Mass at 11:00 a.m. at Holy Spirit Catholic Church, 1035 N. River Road, Saginaw, MI 48609. Rev. Fr. Jack Johnson will officiate. Interment will take place at Mt. Olivet Catholic Cemetery, Saginaw.